Well, the kids have been back in school for five school days now. Guess it's time to get back into the groove of things. Right???? It was a fantastic Summer. I'll be talking about some of that greatness in another post. For now. . . . Back to School for the kids means Back to creating and blogging for me. And a lot of time in my kitchen! So. Much. Time. So, Yippee!!!! Sorry I've been gone, but family comes first. Life is too short to miss some of those moments. Today, I (oh, let's see. 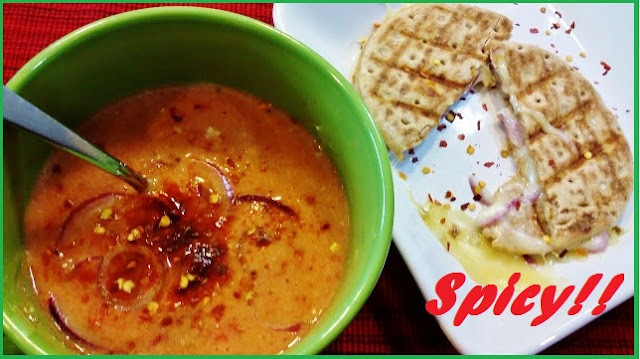 . . how did so many of my recipe posts begin????) I had some grape tomatoes that needed to be used. Yep, I would venture to bet that at least 50% of my recipe posts begin that way! 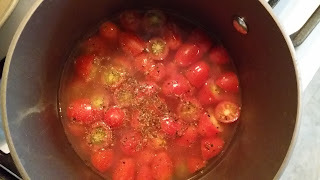 After grocery shopping today, I decided that I would use those grape tomatoes to make a tomato soup. A grown-up tomato soup. None of that sweet, syrupy canned stuff. I like my tomato soup to taste like tomatoes, not corn syrup. I also added spices from my kitchen cabinet to make it more grown up. Spicy! In addition to my spicy, creamy tomato soup, I made a grown up grilled cheese sandwich. Let me tell you, my mouth is still burning from all the spice. Yummo! 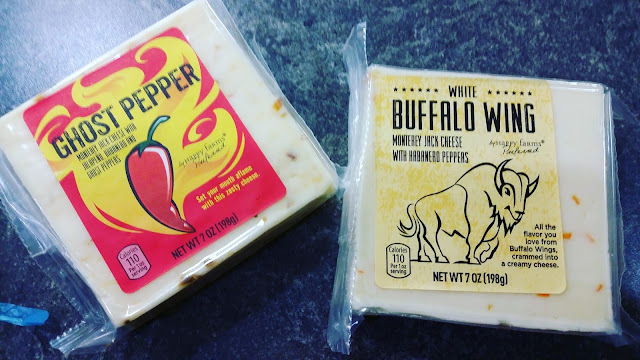 I happened upon these two cheeses while I was shopping at Aldi today and I could NOT pass them up. Buffalo flavored cheese???? Heck yeah! And ghost pepper cheese? That might be a little TOO spicy for me, but I bought it anyway. And the Ghost Pepper cheese is what I used to make my grown up grilled cheese today. Salt ~~ to taste~~ I didn't add any, but I know some people who would like it saltier! Place tomatoes and chicken broth in small saucepan. Cook over medium heat until boiling, about 5 minutes. Turn burner to low and cook for 5 minutes more. Add spices and cook 2 minutes more, smashing the tomatoes a little with the back of spoon or spatula. Turn burner off and use an immersion blender to blend tomatoes until smooth (ish). Add the plain yogurt and stir to combine. 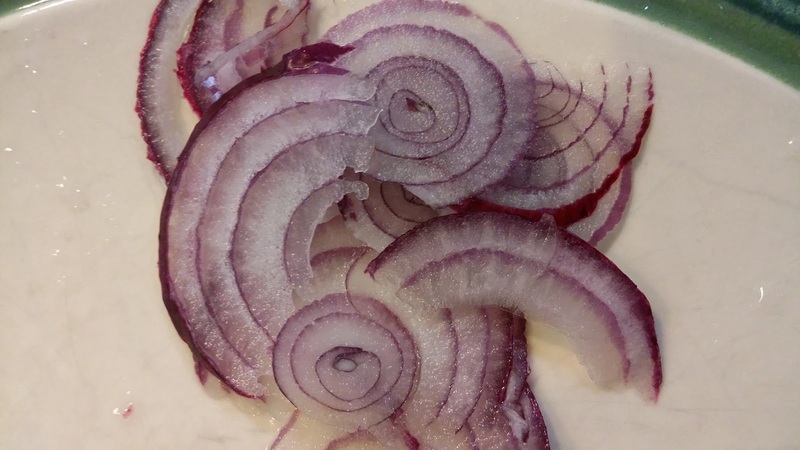 Top with the thin sliced onions. I just used a George Forman grill for my grilled cheese. I don't remember who got me that grill, but it's been a favorite small kitchen appliance since we've received it. I think I'd really like a bigger one, but this little one works for now. Place cheese on bread round, top with thin sliced onions and the other half of the round and cook until the cheese is melted. Dip your cheese sandwich in your soup as much as you like. I'm not actually a huge dipper, but you go crazy if you feel like it. If you have kids, how long have they been back to school now?